The Church of the Holy Sepulchre is one of the important sites for Eastern Christians as it holds references to Jesus Christ. This basilica is a Christian church which is situated within the walls of prominent Old City of Jerusalem which is the place where Jesus Christ once lived. 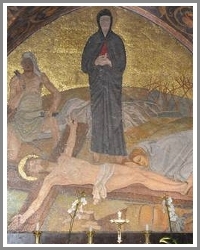 The Church of the Holy Sepulchre is also commonly referred to as Church of the Resurrection. According to sources this prominent basilica was built by the famous Roman emperor Constantine in around 325/326 AD. Constantine I guided her mother Helena to construct basilicas on possible places which hold reference to Jesus Christ. The Church of the Holy Sepulchre is the outcome of the same treaty which now stands amongst the prominent sites in the world. Church of the Holy Sepulchre - Galgotha? Most Christian venerates this Church of the Holy Sepulchre as the Hill of Calvary also sometimes referred to as Golgotha. According to the New Testament in the Holy Book of Bible, Golgotha is the place where Jesus Christ was crucified. It is widely believed that this site is also the place of Jesus’ burial. This church has been serving people as an important scared place especially for Christians since last four centuries. This site is also considered as the possible site of Jesus’ death and then resurrection from death. Church of the Holy Sepulchre - burial Place? The site is a compound of numerous sub-sites which commemorates Jesus Christ. The church also features a rocky outcrop which is considered to be the place where the cross was kept. This site was said to be beyond the boundaries of the city but close to a gate which made it appropriate location for crucifixion. The Church of the Holy Sepulchre also features first century tombs which supports the likelihood of Jesus’ tomb being in the premises of the church. These tombs are also called as “Tombs of Joseph of Arimathea” and are evidently said to be from the time of Jesus Christ. With so many commemorates to Jesus Christ this place is obviously one of the significant holy spots for Christians.